The challenge I have for you is a technique challenge. I would not normally classify myself as a "technique stamper" so to speak, but the one I am sharing with you today is one that I use on a constant basis! KEYWORD: Upload your creation to your blog or online gallery (or both) and come back here and leave a direct link to your creation in the comments section on this post. 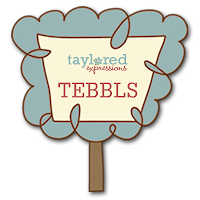 If you upload to an online gallery please use the keyword TEBBLS. PRIZE: Oh YEAH, there's prizes!!! Woohooo!! Upload your creation (with the link entered here on this post) before Midnight PST on September 9th. I will choose my favorite creation and the lucky winner will receive the card I created for this challenge along with a $10 gift certificate to the Taylored Expressions store!!! 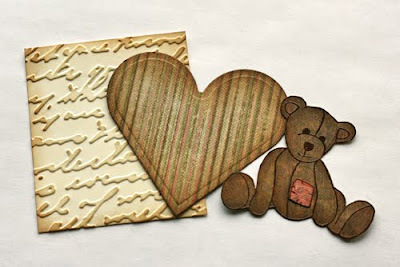 Below is the card I created for my "paper distressing" challenge! 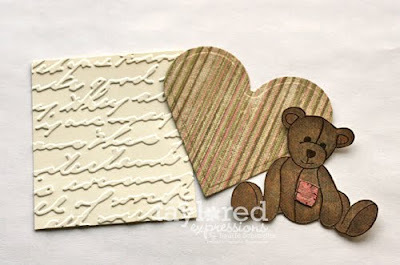 I just adore the paper distressed look...it has such a warm and cozy feel! So...what is paper distressing? Well here is the dictionary definition of distress (well, the part that would apply to how it is used here): to dent, scratch, or stain (furniture, lumber, or the like) so as to give an appearance of age. So, what does this mean for paper crafters? That is where your creativity comes into play!! One of the more popular forms of achieving the distressed look is ink distressing. Ink distressing is simply applying ink to your project to give it an aged appearance. 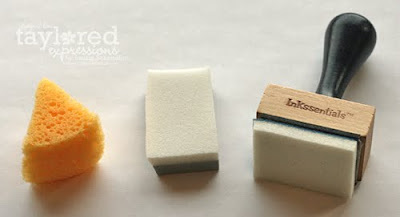 I like to use sponges (such as the ones pictured above) but you can also apply it directly to your project from the ink pad. To give you a visual picture of the warmth that ink distressing adds I've taken a picture of a few of the elements that I used on my card before I ink distressed them. Here is the "after" photo"! I used a combination of Antique Linen Distress ink and Vintage Photo Distress ink. Another way I like to distress my cards is to rough them up - make them look worn! There are so many ways to achieve this, but some of my favorites are: using sandpaper on patterned paper (wear down some of the patter), tear up the edges a bit, rub the edges with the edge of a bone folder, or use a paper distressing tool to shave off part of the edges. 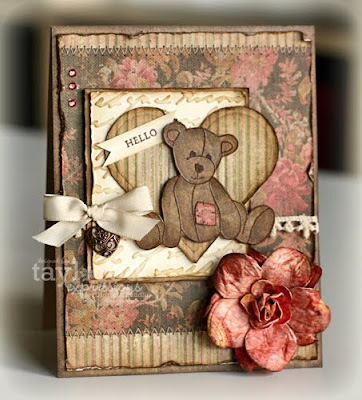 I just ADORE your distressed vintage cards, Laurie - that is definitely one of your signature styles! I have to get one of the ranger sponges for my distressing. your sets using this beary special set are my FAVORITE! Here's my card for the challenge. I am going to be burning the midnight oil to get all of these challenges done! Thx for showing us how you do your distressing. I'm still a cardmaking novice and haven't even ventured into distressing yet but you've made it look easy so I will go and have a try now! Thx for sharing! GORGEOUS Laurie! I LOVE how you distress...I am totally going to try this! I love the look of your distressed cards! Thanks for the before and after pics! What a BEAUTIFUL card from an amazing stamper! I don't distress very much, so this was fun for me... I sponged the flower (combined with Dawn's paper tole challenge) and direct-to-paper distressed the card base. Thanks! This is simply adorable! Great job with the distressing, I rarely do that myself but for this challenge I pulled out my supplies and got to work! Thanks for hosting a great challenge! Here is my distressed card (combined with some of the other challenges! 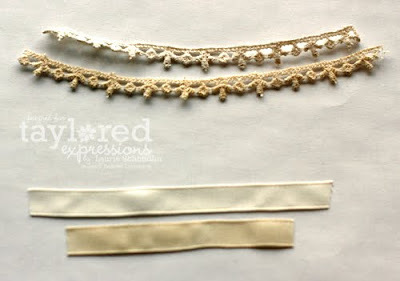 )...I LOVE distressing and crinkling and smudging anything, so I LOVED this challenge! It's not as distressed as it could be, but here's my card! I made a card for your challenge Laurie. Hope you love it as much as I love yours!! Great card! This was so much fun. I really enjoyed this challenge. Thank you! Here is my card! Hi Laurie, I lover your card and all the distressing, it looks great. I have included a link to my card. Thank you for the fun challenge Laurie. I do not distress very often, so it is fun to have the incentive. I combined your challenge with Shron's inspiration - so fun! Your card is ADORABLE!! I like to distress with ink, here is my card. I made a bit of distressing on my card. Nothing like yours this time. But a lot of fun anyway.